1. 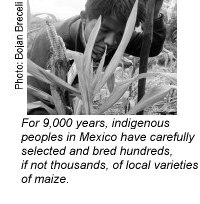 D. Quist and I. Chapela, "Transgenic DNA Introgressed into Traditional Maize Landraces in Oaxaca, Mexico," Nature 414, 6863 (November 29, 2001): 541 - 543. 2. 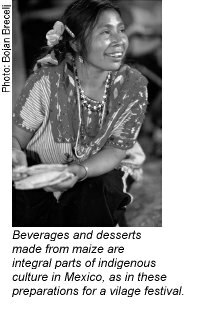 J. Hodgson, "Maize Uncertainties Create Political Fallout," Nature Biotechnology 20 (February 2002): 106 - 107. 3. ETC Group, "Unnatural Rejection: The academic squabble over Nature magazine's peer-reviewed article is anything but academic," February 19, 2002, and "Joint Statement on the Mexican GM Maize Scandal," signed by 144 farmer and other civil society organizations. (Both available online at www.etcgroup.org.) See also: J. Matthews, "Amaizing Disgrace: Monsanto "Up to Its Dirty Old Tricks Again," The Ecologist 32, 4 (May 2002). 4. Editorial Note, Nature 416 (April 11, 2002): 600. 5. P. Elias, The Associated Press, "Corn Study Spurs Debate over Corporate Meddling in Academia," April 18, 2002. 6. C. Clover, "'Worst Ever' GM Crop Invasion," The Daily Telegraph (London), April 19, 2002. 7. 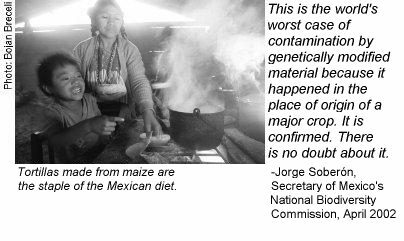 P. Brown, "Mexico's Vital Gene Reservoir Polluted by Modified Maize," Guardian (London), April 19, 2002. 8. Personal communication between ETC staff and Tim Reeves, Director General of CIMMYT, at meeting in The Hague, April 12, 2002. 9. N. Louwaars, J.-P. Nap, B. Visser, and W. Brandenburg, "Transgenes in Mexican Maize Landraces," Plant Research International, Wageningen, The Netherlands; released in April, 2002. 10. C. S. Prakash, "Scientists Say Mexican Biodiversity Is Safe; Concerns about Cross-Pollination Unfounded," www.checkbiotech.org, posted December 21, 2001. 11. See, for example, M. A. Altieri and P. Rosset, "Ten Reasons Why Biotechnology Will Not Ensure Food Security, Protect the Environment and Reduce Poverty in the Developing World," AgBioForum 2, 3 - 4 (1999): 155 - 162 (available online at www.agbioforum.org), and P. Rosset, "Anatomy of a Gene Spill: Do We Really Need Genetically Engineered Food?" Institute for Food and Development Policy Backgrounder 6, 4 (Fall 2000) (available online at www.foodfirst.org). 12. R. McKie, "GM corn set to stop man spreading his seed," The Observer (London), September 9, 2001. 13. A. Scott, "HIV Vaccine Grown in GM Maize," Chemical Week, 164, 18 (May 1, 2002): 33. 14. "En defensa del maiz y contra la contaminacion transgenica," news release issued by civil society organizations (CASIFOP, CECCAM, ETC Group, ANEC, CENAMI, COMPITCH, FDCCH, FZLN, Greenpeace, Instituto Maya, SER Mixe, UNORCA, UNOSJO, and RMALC) in Mexico City on World Food Day, October 16, 2001. Translated by ETC Group. 15. J. Mendelson and A. Kimbrell, "Brief Amici curiae of American Maize Growers Association and National Farmers Union in Support of the Petitioners," J.E.M. AG Supply, Inc. v. Pioneer Hi-Bred International, Inc., U.S. Supreme Court 99 - 1996 (2001). 16. February 18, 2002. Available online at www.foodfirst.org.